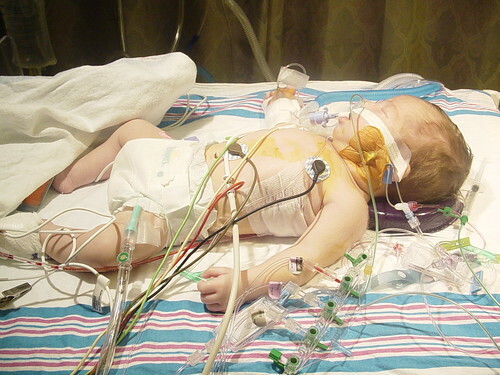 Today is the 10th anniversary of Emily’s heart surgery. She was born with a couple of defects that had to be repaired at 6 weeks old. Through the efforts of great doctors at UAB and Kirklin Clinic Emily has gone on to live a normal life. We celebrate this day every year not with much fanfare but with the acknowledgement that the happiness that Emily has brought into our lives owes a great debt to the medical community of Birmingham. This was Emily in 2003 after surgery. She had more tubes and probes in her than I could have imagined. It was strange in that I never feared to lose her. It was just something we had to get through. To this day I really don’t have a full concept of how serious things were at the time. The doctors ushered us through the process and we came out a happy family on the other side. Looking back today it seems like all of that happened to another person and I am just recounting their story. Time can do odd things. Here she is today at her most recent birthday dinner. She wanted sushi and it was a really great day in that she decided to eat something other than chicken nuggets. She is growing into an amazing young girl. She is smart, sweet, empathetic, funny, sarcastic, and overall a great person. She is a better person at 10 than I am at 38. I learn as much from her as she learns from me. We often forget to enjoy the little things in life. Family dinners, walking the dog while telling jokes about the “moon”, and many other little moments that are gone almost before they begin. It is only when you can’t have that time when you realize what is missing. I can’t imagine what life would be like without Emily around. It is for that reason that Heart Day is special and always will be.